Uncategorized Melvin McCoy walks to support Alpha Omega Veterans Services and raise awareness about Veterans Issues. One of our mailboxholders, Melvin McCoy, is walking from Knoxville, TN. 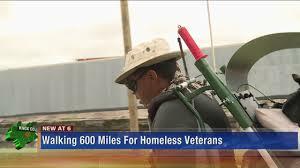 to Washington, D.C. to raise awareness of homeless and distressed veterans issues. McCoy’s path will take him through Bristol, TN, Danville, VA and Richmond, VA before reaching Washington, D.C. using the MULE (Multi-purpose Uniaxial Litter Enginery).